A collection of English family dolls that are hand crafted to depict a typical English Family in the cutest way possible. 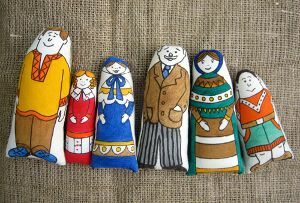 These family dolls come with 100% hand crafted bag made out of cotton, a bag perfect for shopping groceries or carrying books which measures 11" x 9". The painting on the bag reminds us of the simple and hard working farm house life in any average country side home. A unique collection of 6 dolls and a bag for $20 that'll look great displayed in your house.